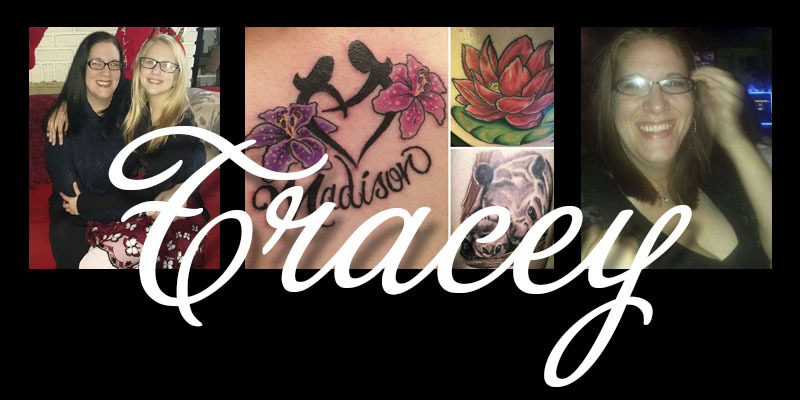 Please help me welcome Tracey to the Tattooed Moms Club! Tracey is my real life BFF. We met under interesting circumstances and ended up becoming great friends that have been through quite a lot together. Even though our lives are both busy, she’s always there for me if I need. On of the most loyal people I know – I am so happy to call her my friend. I have an 11 year old daughter. She’s my world. My daughter loves my tattoos for many reasons. She loves the reasons behind each tattoo and for the fact our friend did them. They think they’re awesome and it’s cool their friend’s mom has them (many of their parents don’t). Style? I just try to get through each day with us in one piece! “No cast today? Ok, good” …but really, especially now at her age (“tween”) teaching them lessons in life, giving her more freedom but reminding her of her age (you’re 11, not 16!) being there for her to help guide her, without being a helicopter mom. Only strict when I need to be. It’s taught me that I’m also a thesaurus. “What dose this mean?” It’s also taught me to be more patient and that kids really watch and pay attention to you, so be a good role model. I face discrimination because I’m a single mom, I have piercings, now tattoos. I get the dirty looks. At my daughter’s elementary school dance a few years back I was told that “tattooed people are dirty” by a kid who’s mom said “yes, so don’t talk to her”. Ok Mrs. Brady go back to your fake perfect world. Scott Cutlip did all of mine. My first one is an “unbreakable mother/daughter bond” tattoo with my daughter’s name in it. It doesn’t matter what we go through, our bond is strong. I also have a lotus flower for me overcoming so much crap in my life and coming out beautiful and strong and unstained. My right calf is a mom/baby panda bears. Those are my favorite animal, of course it’s for my daughter and myself. I love my first one because that was done as I was in a dark time in my life and it was that start of a new beginning. I was 31 when I got my 1st tattoo; the unbreakable bond. When my daughter’s life turned upside down (along with mine) and we were always going to be there for each other. 5 minutes without the phone ringing, someone looking for me, just silence. I also like to just go grab a coffee for a bit and forget about life. That doesn’t happen often. I’d love to go into the future and see what the world is like then. I can share my many mistakes so hopefully the far future can learn from them too. Thanks so much for sharing a bit of your story with us, Tracey!! We’re happy to have you as part of the Moms Club!! All featured moms are part of the “Moms Club” and you can find all of their posts in the Moms Club category. Get to know the moms in the club – they’re all amazing! Prev post Featured Tattooed Mom: Jill L.
Next post Featured Tattooed Mom: Jessica K.